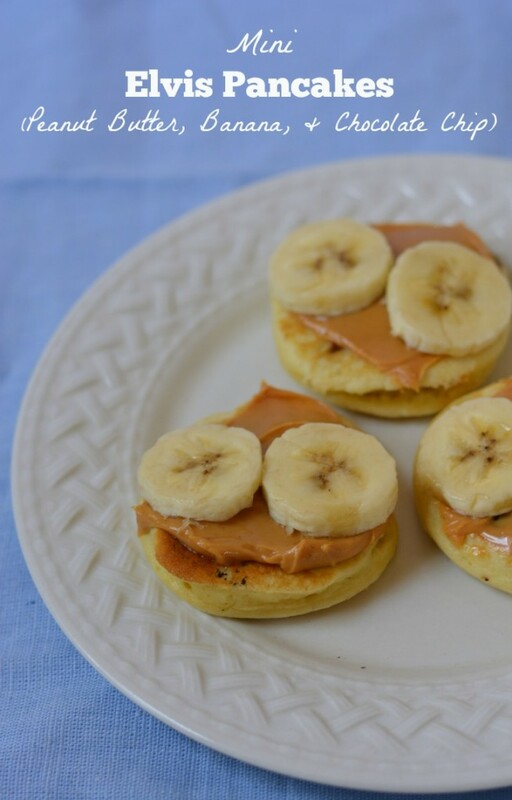 Enjoy Peanut Butter for Breakfast with these easy and fun mini Elvis inspired pancakes! 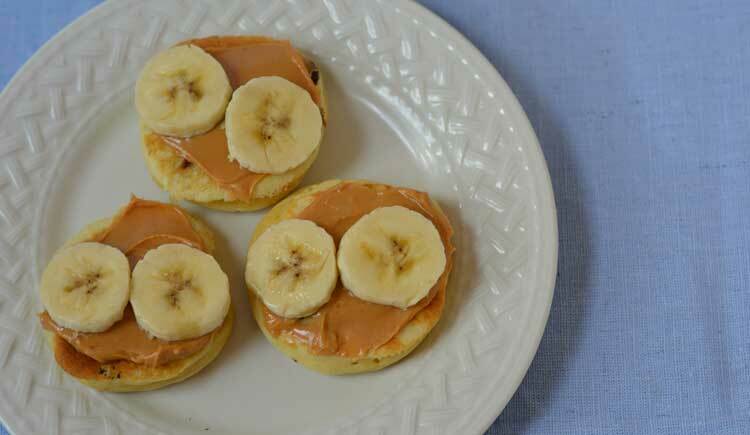 Top mini chocolate chip pancakes with peanut butter and bananas. We are now in to our third week of school and I feel like I have a better handle on our morning routine. Breakfast can be stressful on busy weekday mornings so I'm always looking for a way to make it easier and faster while providing a nutritious meal my kids will actually eat. And since September is Better Breakfast Month, it seems like the perfect opportunity to refine our breakfast options. An easy way to do that is by using peanut butter at breakfast. Peanut butter is high in fiber, protein and good fats. It is also a natural, plant-based source of eight grams of protein and more than 30 essential nutrients and phytonutrients. Protein at breakfast will help your kids feel fuller longer and peanut butter is a great way to get some much needed protein in the morning. 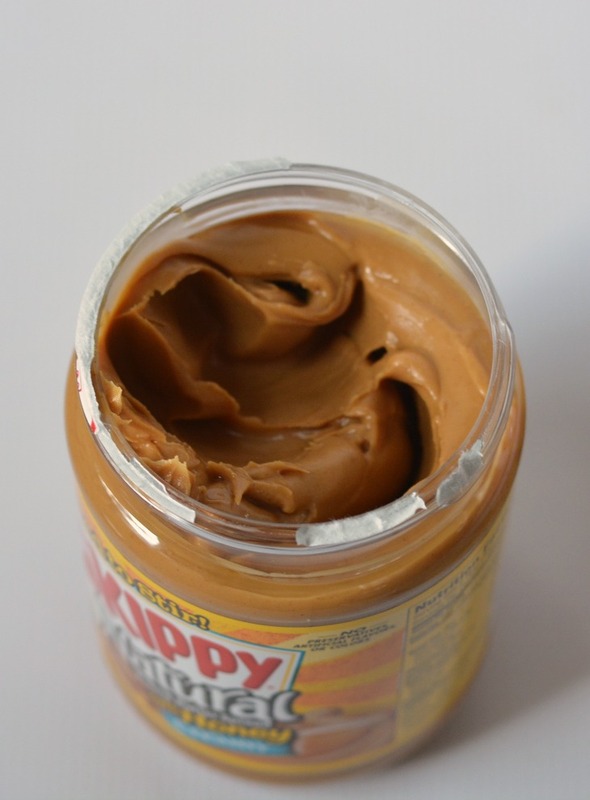 Did you know it takes about 540 peanuts to make a 12-ounce jar of peanut butter?! Check out the National Peanut Board for more fun facts and information on peanut butter! I first made Elvis pancakes a few years ago. Apparently Elvis loved the combination of chocolate, peanut butter and bananas. I was curious to see what that tasted like and trust me – this one flavor combination you have to try! Start with a batch of mini chocolate chip pancakes. I use a homemade baking mix to make mine but any recipe will do. You could even use frozen ones from the grocery store. 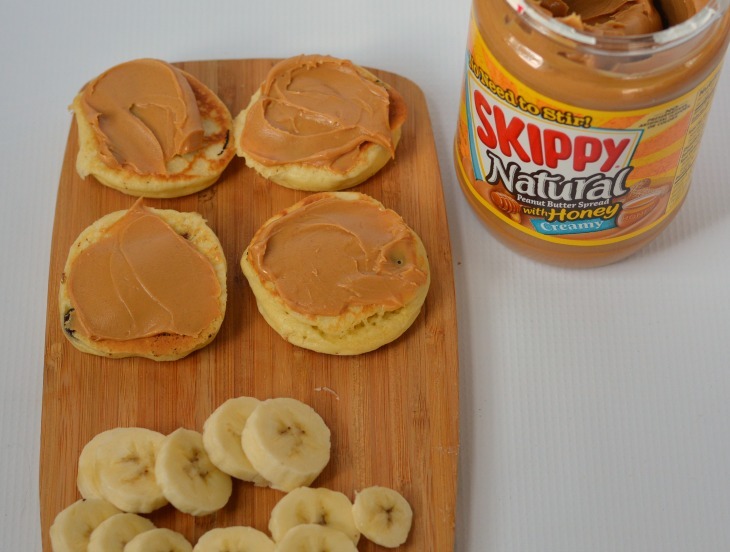 Slather the tops of the pancakes with your favorite peanut butter. I put on a nice thick layer because I want the kids to get as much protein as possible. Then top the pancakes with a slice or two of banana. Your kids will probably think you are a little crazy, but trust me – these are delicious! Elvis was totally right about this fun flavor combination. Make sure to follow the National Peanut Board on Facebook and Twitter for more delicious peanut butter recipes to make your mornings easier. To help you get inspired – I'm giving away a fun Peanut Butter Prize Pack! One winner will receive a $25 Walmart Gift Card, a Peanut Butter Coupon & a bag of peanuts! Just enter in the widget below! Giveaway is open to U.S. residents age 18 and older. The National Peanut Board and Izea media hold all responsibility for prize delivery. Peanut butter is literally my favorite food! The pb and fruit stuffed french toast sounds yummy! The Oven-Roasted Nutty Spring Vegetables looks tasty. I like the Blueberry Peanut Smoothie recipe. 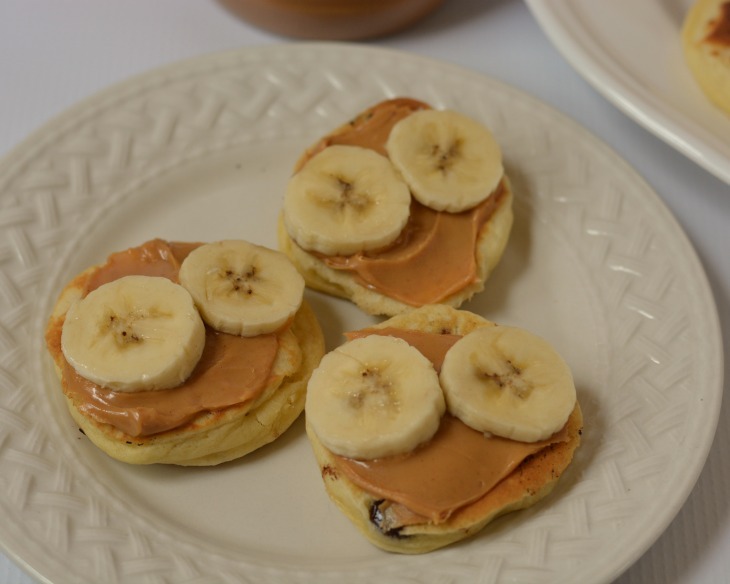 I would love to try the Banana Peanut Butter Sandwich Cookies! I like the Peanut Butter & Fruit Stuffed French Toast! Unsure how to get a link for it. I tried to post a link but it keeps saying You have too many URLs in your comment. Please go back and remove some. The Peanut Apple Toastie looks like something we’d enjoy. My favorite would be the Peanut Butter and Fruit Stuffed French Toast. i am going to try this recipe nationalpeanutboard.org/recipe/desserts/nutty-dutch-apple-dessert/ it sounds amazing. hopefully i can make it tonight. i have to go with the nationalpeanutboard.org/recipe/power-your-breakfast/peanut-powered-breakfast-cookies/ looks super super yummy. I would try the peanut butter blueberry waffles. Yum! I would love to try the bourbon beef kabobs. I’d like to make the Masala Cutlets, they sound pretty good! I would like to try the Peanut Blueberry Waffles. I like the Peanut Butter & Fruit Stuffed French Toast recipe. It won’t let me post a link! Soup is always a winner at my home. I would like to try making the Fruit Napoleon. It looks really good. This stew looks delicious – Spicy Carribean Vegetable Stew! I am not a morning person, so always need a good breakfast on the go. The Breakfast Cookies sound delicious! This one looks really good peanut-powered-breakfast-cookies (it won’t let me use the url). I love peanut butter its one of my favorite foods. We all like soup at my home. New ones to try are great. the funky monkey muffins look good. it won’t let me leave the link for some reason , says I have too many links when I have just one. the Power Packed Peanut & Chocolate Covered Cherry Smoothie looks divine. I am unable to leave the URL as I keep getting an error code that I have too many URL’s in my comment. I tried this 5 times and would not work. I think I would really like these nationalpeanutboard.org/recipe/power-your-breakfast/peanut-butter-pancakes/. I would love to try the peanut farro mushroom burgers! The form is not permitting me to submit a URL. I would love to try the peanut butter pancakes and syrup. I was forced to remove my link because of qError Code: mu04. It kept saying my one link was too many. The recipe that sounds best to me is the one for the Funky Monkey Muffins nationalpeanutboard.org/recipe/power-your-breakfast/funky-monkey-muffins/ ! Anytime you can get away with having chocolate for breakfast is ALWAYS a good thing in MY book! LOL! I like the Dixie Peanut Brittle in the Microwave. I eat peanut butter almost every day. LOVE IT. the Funky Monkey Muffins look incredibly delicious! 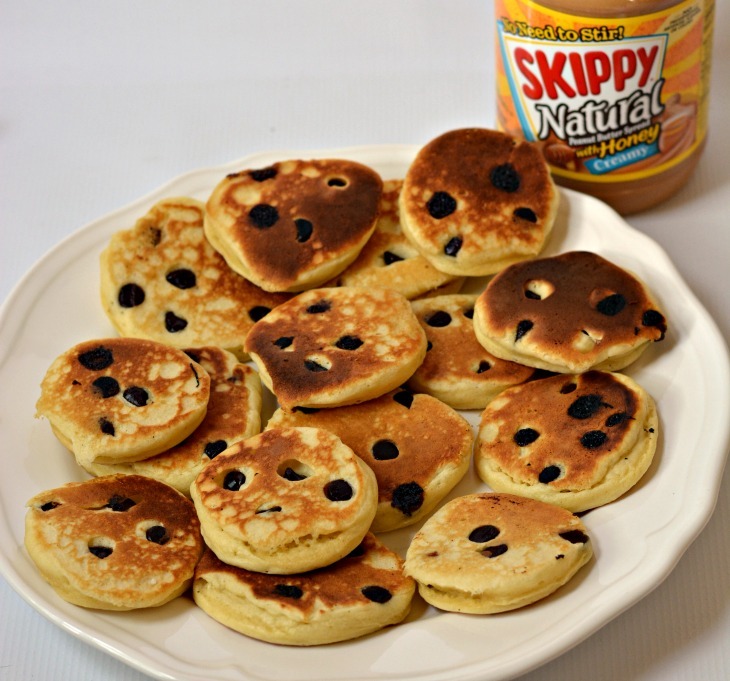 I would make this for breakfast, without a doubt. This looks simple, quick, and delicious! I tried adding the link, but when I hit post comment it says: your post contains too many URLs. So. . .the Grilled Peanut Butter & Banana Sandwich is what I was trying to post! My favorite breakfast recipe is the one for peanut butter power bars. I like the Banana Peanut Butter Sandwich Cookies! They look so delicious. This looks so yummy for fall!